Born in Belgrade on September 26, 1981. He obtained his BA degree from the University of Belgrade, School of Law. Elected member of the City Assembly of the City of Belgrade from 2008. From 2008-2012 he also served as the Head of the Parliamentary Group of the SPS-PUPS-JS at the City Assembly. On June 2012 he become elected member of the City Council of the City of Belgrade. He held this position until November 2013. He was appointed member of the Interim Authorities of the City of Belgrade, by the Decision of the Government of the Republic of Serbia of 18 November 2013. 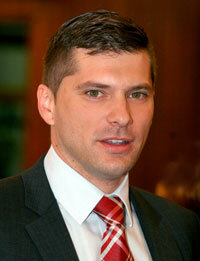 On April 23, 2014 he was elected Chairman of the Belgrade City Assembly. He serves as Secretary of the Executive Committee of the Belgrade Branch of Socialists Party of Serbia (SPS). Member of the Executive Board of the Central Committee of the Socialists Party of Serbia.